Geeks and non-geeks alike should do their research when buying electronic devices to make sure they can actually do what they want, and don’t have unacceptable attributes. In this post I’ll give some examples, and some helpful guidelines. 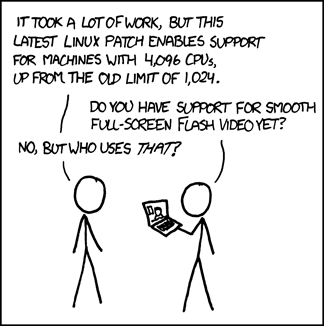 I’ve been using Linux/UNIX for about 20 years. I am also Assistant Director of the Boston Linux and UNIX Group, and have contributed to several open source products. In general, I find open source software more flexible, more transparent (no security through obscurity), and more focused on what’s needed instead of what marketing says would be cool. I like that open source software is usually developed modularly, with separate components each doing what they do well, each designed to be combined with other component, each with its inputs and outputs documented for fitting Tab A into Slot B. Open source’s community support model (with a sufficiently large community) is often far superior to calling tech support. All that said, I still believe very strongly in “the right tool for the job”. Sometimes open source is not the answer. Just like commercial software, it’s important to evaluate not only how well the software suits your need, but the “health” of the product and its creators. Just because it’s still available doesn’t mean it’s still supported, updated, and in common use. That may not be a deal-breaker for you, but it does need to be factored in to the decision. I am a Knowledge Geek. I like collecting knowledge, searching knowledge, and organizing knowledge. If you read my post on [post=”give-me-liberty” text=”my recent cellphone research”], you know what I mean. I take notes at most meetings and conference I go to. That often turns out to be very advantageous, especially on longer-term projects where it could be important to find out when a particular decision was made, by who, and why. I’ve always named the files staring with the group/project/company name, followed by a YYYYMMDD timestamp, and optionally a topic after that, so finding things isn’t too hard. The larger problem I started facing recently though, is I have been taking notes on multiple computers. I needed a way of making sure I had access to at least some of these notes when and where I need them. Up until fairly recently, I had my server and my laptop. All notes were taken on the laptop (and backed up to external USB drive). Then I got an iPhone, and found note-taking on that quite practical (using QuickOffice). Then I got a netbook (Dell Mini 10), and started using that for meetings (after I got the netbook, I didn’t use the iPhone for note-taking very much). The end result was these meeting notes were not where I needed them. I needed a way of synchronizing these notes between computers. “Give Me Liberty And Give Me Bugs” is a quote by Martin Owens, leader of Ubuntu Massachusetts and fellow BLU (Boston Linux and UNIX Group) member. You see, it all started innocently enough with a thread on the BLU list about the iPad. The flames hadn’t actually reached the second floor yet, so I decided to squirt some napalm on it by mentioning that (1) I just bought an iPhone to replace my dead-end Windows Mobile phone, and (2) I have given up on trying to sync music and PDA data with Linux, and am now using an old beater Windows XP laptop just for syncing and backing up my phone. You see, I’m a PDA geek. I track lots of metadata about my calendar events, contact data, tasks, etc. Since the PDA as a separate device is pretty much dead at this point (s0b) I rely on finding third party software for my phone. But back to the argument. There were two dominant camps. Those that see any vendor lock-in techniques, DRM, planned obsolescence, and anything that prevent you from doing whatever you want with something you own, as an affront to nature, and should be illegal. They would rather have Open Source/unencumbered products that didn’t quite work right than locked-down commercial products that work very well, but only in the One True Way as determined by the vendor. Those that see companies as entities that will generally focus on their own goals, charging as much as they can get away with for as little as they can get away with, targeting their products towards the target audience they choose. They feel to expect otherwise is being idealistic. One should act accordingly, and not act shocked when Apple releases a new version five months after you buy one. Those who know me will back me up on this; I evaluate things fairly. You will never hear me say $FOO is clearly superior than anything else, and there’s no reason for anyone to use anything else. That includes Linux and Linux distros. I calls them as I sees them, and I do not feel that Linux is always better in every situation for every user, nor is one distribution/brand of Linux clearly the best for all situations. And I’ve been using Linux since Red Hat 4.2 in 1997 (I still have the disks). I recently installed Ubuntu Karmic (9.10), waiting a few months after release as I usually do so the major bugs are already fixed, and ran into many more problems than I expected. I find this unfortunate, because one of the main reasons I switched from Fedora to Ubuntu is no longer valid. Some of this post is about this release, and some is about the state of Linux in general.